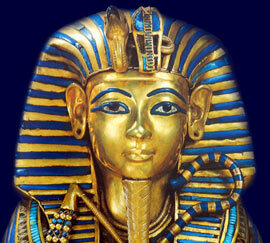 The term pharaoh was the title given to a ancient Egyptian kings, such as Tutankhamun. An ancient Egyptian king, or pharaoh, was considered to be a living god and worshipped as a deity. The pharaoh was an absolute ruler of Egypt and both the political and religious leader. Tutankhamun was first known as Tutankhaten, meaning "Living Image of Aten"
Why Tutankhamun was famous: This relatively minor boy king was made famous by the discovery of his intact tomb KV62, complete with all of its wonderful treasures, by the Egyptologist Howard Carter. Biography and accomplishments: Background to the life of Tutankhamun - The chaotic reign of one of his predecessors, Akhenaten, radically changed Ancient Egypt from a polytheistic religion, with many gods, to monotheism (the worship of one god). Akhenaten used the might of the army and its powerful military commanders to destroy the old religion and its priesthood. He moved the entire population of Thebes to his new city of Armana. The traditional temple based economy, run by priests of Amun, had been replaced by the new regime, run by local administrators and military commanders. The new economy began to collapse due to the greed and corruption of the new officials. The Egyptian people were unhappy with the changes. Akhenaten did nothing to restore order and was forced to abdicate. The army were torn between their loyalty to the Pharaoh and their loyalty to the people. Compromises had to be made. Temples to the old gods were reopened, their worship was allowed and the roles of some of the priests of Amun were restored. But the god Aten remained as the supreme god, allowing continued worship to the Aten. At this time a mysterious Pharaoh called Smenkhkare took the throne, who could have been Nefertiti. It then passed to Tutankhamun. Tutankhamun Biography and accomplishments: Tutankhamun was born c1343 BC and was brought up in Armana (dedicated to the god Aten) the city established by his father Akhenaten. He was 9 years old when he was made Pharaoh in 1334 BC. During the same year he married Ankhesenpaaten, his half sister, the third daughter of Akhenaten and Nefertiti. In the third year of his reign, due to pressure from the traditionalists, he changed his name from Tutankhaten to Tutankhamun. Queen Ankhesenpaaten also changed her name to Ankhesenamun, reflecting the growing acceptance of the old god Amun. During year 4 of his reign he, and the royal court, moved back to the old capital at Thebes (modern day Luxor) which was also the center of worship of the Ancient Egyptian god Amun and the power base of the Amun priests. The boy King Tutankhamun was advised by his Grand Vizier Ay who held enormous power over Tutankhamun. He was also supported by the military led by General Horemheb. During the reign of Tutankhamun (1334 BC -1325 BC) Horemheb was designated as the Boy King's "Deputy" and was recognised as heir to Tutankhamun. The children of Queen Ankhesenpaaten and Tutankhamun did not survive. His two daughters were still born and were buried with Tutankhamun. During his reign Tutankhamun commissioned various building work including the restoration of some temple properties at Karnak and Thebes. There were also military campaigns in Nubia and Syria during his reign, although it is doubtful that Tutankhamun played any part in them. Tutankhamun died at the age of 18/19 and his cause of death remains a mystery and subject to much speculation. Did Tutankhamun die a natural death or was he murdered? Who might have killed Tutankhamun? His tomb was hastily constructed by Ay who succeeded him to the Egyptian throne. For a full biography and full details of his life and mysterious death please refer to the Sitemap. Each section of this Ancient Egyptian website addresses all topics and provides interesting facts and information about the Golden Age of Pharaohs and of Tutankhamun. The Sitemap provides full details of all of the information and facts provided about the fascinating subject of the Ancient Egyptian Kings- their life, family, reign, dynasty, important dates and events and accomplishments.